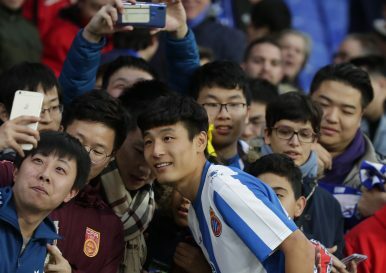 Newly signed Espanyol soccer player Wu Lei poses for a picture with supporters during his official presentation at RCDE stadium in Cornella Llobregat, Spain, Tuesday, Jan. 29, 2019. The football (soccer) transfer market is an ongoing, worldwide exchange of players of every nationality. The most widely followed transfer markets are situated within Europe’s top five leagues: the Premier League (England), La Liga (Spain), Serie A (Italy), Ligue 1 (France), and the Bundesliga (Germany). In recent years, the big price tags and deep pockets of several individuals and clubs have gained special notoriety, bringing into question how big money is changing the future of the game. Over the past five years, China in particular made headlines with its emergence as a major player on the international transfer market stage, offering huge salaries to entice some of the world’s top footballers to make their way to China. East Asia, however, is now stepping into the transfer market with more than just cash in hand. Increasing numbers of East Asian players are becoming household names and populating the top leagues. There are currently two South Korean players in the Premier League: Ki Sung-yueng at Newcastle United, who recently retired from international football, and the famous Heung-min Son at Tottenham Hotspurs, who won the Football League Player of the Year at the 2019 London Football Awards. According to SoccerWay, there are many South Koreans playing in other major leagues, including two in France’s Ligue 1, two in Italy, five in Portugal, 14 in Spain (two in La Liga), and 21 in Germany (three in the Bundesliga). Japan also has representation in the League, with Yoshinori Muto at Newcastle United; Maya Yoshida at Southampton; and Shinji Okazaki at Leicester City, who won the 2015-16 Premier League. There are seven Japanese footballers playing in France (three in Ligue 1), five in Portugal, nine in Spain (two in La Liga), and 38 in Germany (six in the Bundesliga), among other European leagues. Compared to its other East Asian counterparts, Chinese football is more well known for extensive investment in bringing foreign players to domestic Chinese leagues, rather than sending domestic players abroad. Recent regulations of the Chinese Football Association (CFA) have limited this wave of immigration into the Chinese Super League, introducing player salary caps, quotas for the number of Asian players under the age of 23 on the pitch, and 100 percent taxes on transfer fees. The subsequent stifling of the Chinese transfer market has ultimately led to a window of opportunity for Chinese football to rebrand itself from investor to investee. Following China’s performance at the 2018 AFC Asian Cup, China became a hot topic not for its money, but for the talent of Chinese players themselves. Most notably, Chinese striker, Wu Lei, signed with Espanyol in La Liga following the AFC Asian Cup, leaving behind an illustrious career at Shanghai SIPG as the all-time top goalscorer. Although his start has not been especially noteworthy, his presence has been. His official debut, where he played only 12 minutes on the pitch as a substitute, was reportedly watched by 40 million people in China. Despite the presence of Chinese players in La Liga, Wu is the first Chinese player to ever score in the top Spanish league. Wu was also rumored to have received an offer from Watford FC in the English Premier League. Beyond Wu, there are several other promising Chinese prospects spread across the other top European leagues. There is currently one Chinese player in France’s Ligue 2, 14 in La Liga, and 24 in various leagues in Portugal. While there are currently no Chinese players in the Premier League, this has not always been the case. Sun Jihai, perhaps the most famous Chinese player, spent several years in the United Kingdom. Sun first moved to Crystal Palace on loan in 1998. After returning to his Chinese club, Dalian Shide, in 1999, he then signed as the first Asian player for Manchester City. He was the first East Asian to score in the Premier League in 2002, and he received the club’s “Best Player” award the same year. His career was plagued by a series of injuries that kept him off the pitch for the 2004-2005, 2006-2007, and much of the 2007-2008 seasons. In 2008, he signed for Sheffield United, but he was released in 2009. He then returned to China and cycled through four different Chinese teams before retiring. On the national side, he helped China to qualify for the 2006 FIFA World Cup. While Sun was a pioneer for Chinese footballers in Europe, he was not immediately succeeded by other Chinese footballers. If China continues to produce players like Sun and Wu and send them abroad, the story of Chinese football could be similar to the story of Chinese basketball. Although bringing American basketball players to China’s basketball league may bring in viewers, the presence of Yao Ming in the American NBA changed Chinese culture. Similarly, the presence of foreign players in Chinese leagues may draw international and Chinese audiences alike, but the presence of Chinese players in foreign leagues may well bring China’s love for football and international investment to a new level. Watching nationals succeed in foreign leagues may also bring new life to the domestic game, inspiring young Chinese to play and emulate footballing role models that look and speak like them. The likes of Wu Lei and other Chinese footballers may be blazing a trail by making both domestic Chinese and foreign audiences associate Chinese football with more than just Chinese money. Chinese football is also about Chinese players themselves, and how they can — and will — change the global game. Whither China’s National Football Team? Can throwing resources at China’s football infrastructure translate to success on the international stage?